When it comes to figuring out where to plan your vacation is easier said than done. Mostly you would end going over hundreds of options, debating types of holidays beach, adventure, heritage of leisure; checking with friends and family for ideas or recent experiences; looking at those insta-stories doing the rounds on social media; going over those blogs, magazines and newsletter for the next big thing. We’re here to help you understand why Oman should be your next vacation destination for this year. The country is generally not the first that pops into the mind when looking at options for where to go on a vacation and that it not for lack of attractions; Known for its stunningly diverse landscapes that vary from wide swathes of goldens sand dunes and lush Wadis(valleys), to rocky mountains and blue seas, Oman has it all. In fact we would go on to say that the very fact that the hordes of tourists have not yet chosen to descend of this hidden gem in the Middle East is one more reason that you should be headed there right now. At Oman, you will experience elaborate mosques, implacable forts, golden beaches, bustling souqs, modern cities and vast unexplored wilderness that combine with ancient traditions, delicious dishes and warm hospitality to make for a holiday that you will treasure for a lifetime. Even though the middle east summons images of never-ending sand and dust, Oman has much to to offer to visitors. There is a reason the the official tagline of The Sultanate of Oman's Ministry of Tourism first major campaign is ‘Beauty has an Address - Oman’, and that is because it is spot on. 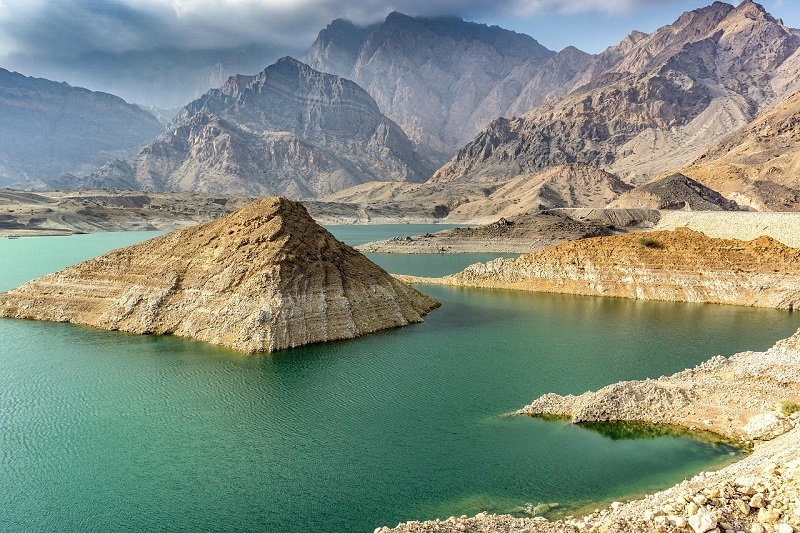 Oman offers a breathtakingly wide array of landscapes to explore from the serene blue waters that make up the coastline to the green Wadi’s, towering mountain ranges and deep sinkholes. The Sea of Oman, the Arabian Sea and the Strait of Hormuz combine to spread over 3,165 km of the Beautiful coastal border of Oman with some popular beaches in Oman including the Finns beach, Ras Al Hadd, Al Sawadi, Bandar Al Jissah and Yiti beach. A 'wadi' is the Arabic word for usually dry valleys which will be filled during the rainy season. The freshwater lagoons here are sometimes accompanied by waterfalls and may have some splendid caves to swim through. Each and every Wadi is truly unique and offers a special experience. Wadi Bani Khalid or Wadi Shab are two of the many Wadis that dot the land here. The Al Hajar mountain, running through northeastern Oman, is where Oman’s tallest peak, the majestic green Jebel Shams stands as well as the deep Wadi Nakhr Gorge. The Empty Quarter is 650,000 km2 of desert, with dunes of white and orange sand rippling across the horizon, while the fjords of the Musandam Peninsula hide isolated fishing villages and white sandy beaches makes in one of the best vacation spots of the year. The country is a delight for animal lovers and ecotourists, with its expansive landscapes being home to many exotic species like the Oryx, and rice marine life including numerous dolphins. You are likely to spot spinner dolphins, humpback, blue whales and numerous turtles(including their hatching) during migration season, and can also visit the Jebel Samhan Nature Reserve in Dhofar to see wild Arabian leopards. Many also visit the country to witness the Turtle hatching season. 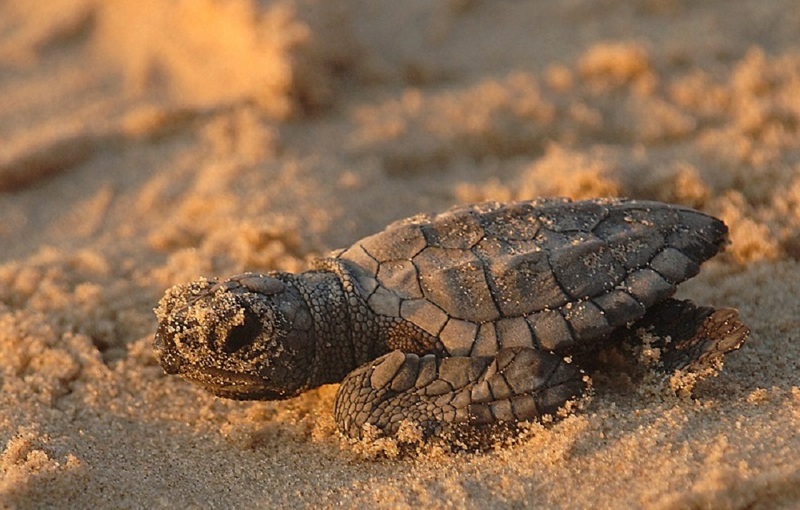 Visit Ras Al Jinz Turtle Reserve to watch the natural process of nesting and hatching right in front of your eyes and bear witness as thousands of turtles make their journey to this country to lay eggs, with the young hatching growing up to undertake the same journey of thousands of miles. The countryside in Oman is rich in man-made beauty too, in the form of the stunning Forts, Castles, Mosques, and more that display the historic Omani architecture. The country’s turbulent and colourful history is visible in the forts, villages and ancient homes in every region around the country. Visitors to the Sultanate can also see the Omani story through the well-presented museums across the nation. 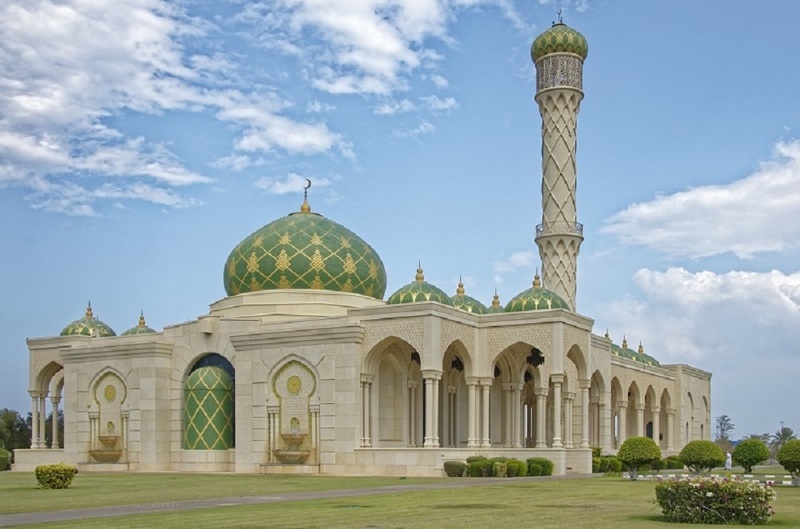 The Sultan Qaboos Grand Mosque is a gem of Omani architecture with magnificent archways that lead to lavish courtyards bedecked with chandeliers, ornate doors, and white marble floors, that is surrounded by manicured lawns on the outside. The Nizwa Fort is another attraction due to the traditional architecture dating back to the 9th century when it was the capital of Oman. The Fort has maintained on display ancient artifacts and a few interesting defense features including honey traps and pitfalls.Other Must Visits include the Jabreen Castle, the Bahla Fort, Nakhl Fort, and the Kasbah Fort. Oman is a haven for foodies. Whether you want to enjoy international delicacies or sample some Omani cuisine, there is something for everyone here. Though not as well known outside the country, Omani cuisine is a remarkably delicious case of cultural transfusion. Situated on the coast and being home to vast deserts and towering mountains along with being a trade hub for many centuries has led to the evolution of a unique flavour combination in Oman that you are unlikely to find anywhere else. The rich spices and unusual combinations make for a truly delighful Culinary treat. Even if you are a non-adventurous foodie, you are sure to find something to suit your tastes as at most places you will be able to find a variety of cuisines being offered with plenty of popular fast food chains also making their presence felt in the cities. Seafood lovers can rejoice as fishing is a favorite pastime of many locals ensuring a plentiful supply of freshly caught seafood cooked to perfection. Also be sure to try Shuwa on your stay here, a traditional dish of lamb or goat seasoned and marinated in rich spices, then wrapped in palm leaves and slow cooked in an underground oven to make a delicious, tender dish that is generally served on a bed of rice. Another item on your must-try list should be Omani halwa, a traditional sweet-dish made with concentrated butter, caramelized sugar, almonds, and wheat starch which is usually flavoured with saffron, cardamon and rosewater. You should try it with the local Omani kahwa (coffee). Yum! 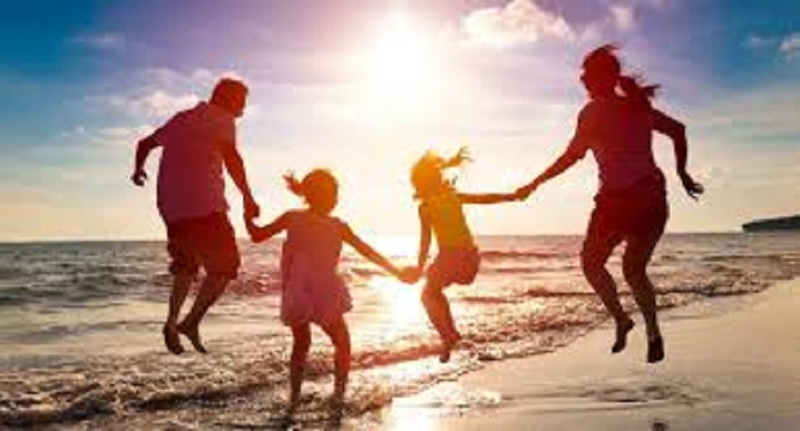 Oman is a great destination to plan a family holiday at, as it is well connected with major airports and a fantastic destination to visit over Christmas or fall and spring school holidays as this is when the weather is at its best in the Sultanate. Oman is also considered one of the safest, most stable Middle Eastern countries, so it’s the perfect choice for families looking for something a little different. While visiting Oman families can opt for a range of family friendly activities from camel rides, camping at the beautiful Wadis, snorkelling and much more. Both children and adults will enjoy taking a dip in the pristine blue waters of the Wadi’s which make for popular day trips or picnics. Visit the numerous museums is a great educational experience and tours of interesting places like the AL Hoota Caves make for a fun trip for all involved while learning more about Oman. For those in the mood for a little luxirious living can enjoy an evening of art and performances at the chic Royal Opera House in Muscat, which consists of a concert theatre, an auditorium, a formal landscaped garden, a luxury restaurant and more. 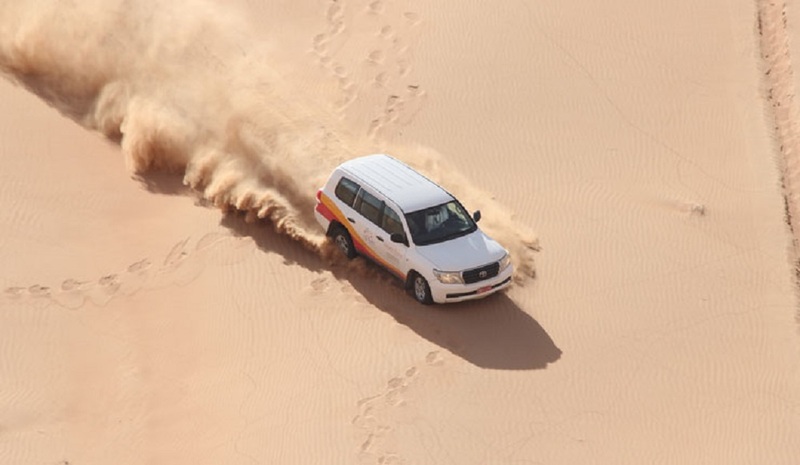 If you are searching for an adrenaline rush too, Oman is the right place for you. With Oman being listed among the best diving sites in the world, you can come experience the crystal clear waters here are home to countless species of fish and exotic coral reefs. Some of the favourite coral reef destinations include the Daymaniyat Islands, Musandam, Bandar Jissah, Bandar Khayran, Masirah Islands, Dhofar, and Marbadh among others. And because Oman is not yet on the of many diver's vacation spots, you will often get the opportunity to have the mesmerising reefs and bright marine life all to yourself, unlike at other crowded tourist spots. You can also set out on a desert safari or indulge in activities like sand boarding, dune bashing, quad biking, camel safari and much more at the ever changing dunes of the Wahiba Sands. This massive desert covering a span of 12,500 km with dune towering to heights of up to 150m requires a 4x4 and the help of a guide to explore and if you want to spend a night in the desert, a camp makes for the perfect place to experience the starry skies while enjoying the tranquil desert. The bustling souqs are home a myraid of enticing good ranging from traditional silverware to scents, foods, spices, carpets, scarves, trinkets and souvenirs to bring back for your friends. You can even choose to pick up a Traditional Khanjar, a ceremonial dagger that is shaped like a ‘J’ and resembles a hook, just be sure to check that you won’t get in trouble at the airport. At most Souqs, you will find tourists and locals alike haggling and bargaining over both everyday use goods and mementos. When you grow tired you can always take a break to enjoy some snacks( or a full meal) to replenish your energy before returning to the fun. The Mutrah Souk located on the Corniche in Muscat, is a must visit on your trip to Oman’s capital city as tourists and locals mingle in the peaceful corners without the frantic rush of other larger souks that cater solely to tourists. The market located at a waterfront and having many restaurants makes it the perfect place to plan a leisurely shopping escapade where you can enjoy a pleasant walk down the corniche to enjoy the sea breeze and views of the Hajar mountains afterward. 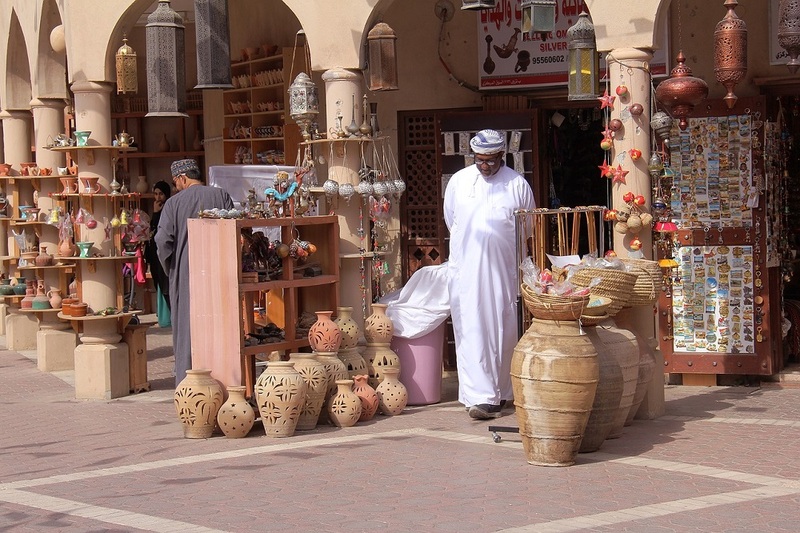 The Nizwa Souq is another popular shopping option as it can easily be combined with the Nizwa Fort. Here, you can easily pick up some traditional souvenirs or attend the cattle market on Fridays. One of the things that has tourists coming back again and again after the first visit is the friendliness, generosity, and hospitality of the people of the country.. Omanis can be extremely generous in the hospitality taking pride in their Arab characteristic of being excellent hosts. You will often be offered dates, along with freshly prepared coffee flavoured with Cardamom. Then you may be served fruits which are followed by different types of freshly baked cakes, cookies and Oman Halwa (sweet). This usual course of hospitality is called ‘Qahwa,’ or ‘Kahwa’ which means coffee in Arabic, and includes the serving of the above-mentioned dishes. A visit to Oman is really a vacation of choices. You can stay in the lap in luxury at breathtaking mountain top resorts, or beachside resorts that are surrounding with views of valleys and mountains around the Persian Gulf or opt to keep things simplistic with a few nights camping out in the desert. 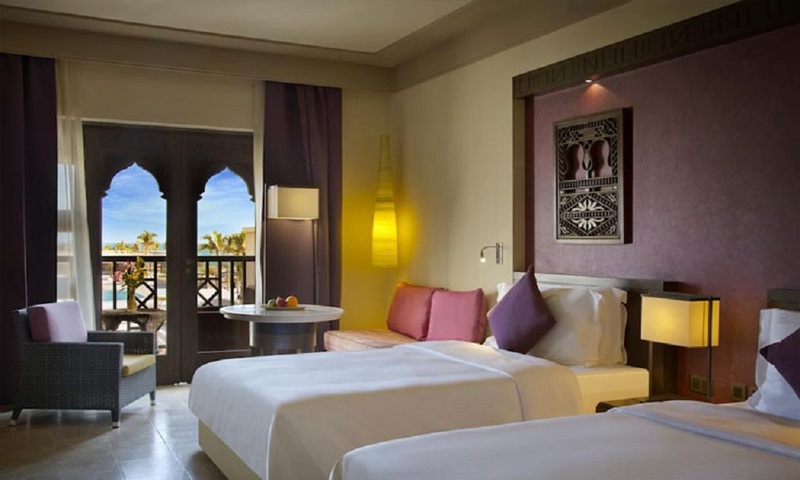 The variety of options for accommodations are unending with Oman offering excellent and varied range of accommodation, from world-class hotels to wild camping. From 5 star resorts and hotels that offer all the frill and more to mid-range accommodation and camping options. Even camping under the stars can be conducted as either wild camping in the Empty Quarter or a choice of glamorous desert camps that offer every luxury.